From Ron Marz, Darryl Banks and Romeo Tanghal comes GREEN LANTERN: KYLE RAYNER VOL. 1, collecting the classic Green Lantern adventures long out of print! Hal Jordan had been Earth's Green Lantern--a proud hero in an even prouder tradition. But even heroes have their limits, and when his hometown of Coast City was destroyed by Mongul, Hal Jordan reached his. When the Green L From Ron Marz, Darryl Banks and Romeo Tanghal comes GREEN LANTERN: KYLE RAYNER VOL. 1, collecting the classic Green Lantern adventures long out of print! Hal Jordan had been Earth's Green Lantern--a proud hero in an even prouder tradition. But even heroes have their limits, and when his hometown of Coast City was destroyed by Mongul, Hal Jordan reached his. When the Green Lantern Corps' creators refused Hal the power to change the past, something inside him snapped. He crossed the line he had sworn he never would, and stripped the Guardians of the Universe and their legendary Green Lantern Corps of every shred of power they had, killing many of them in the process. He became a man consumed with his own rage, and an era of heroism ended. The ring and legend of the Corps, however, would not be extinguished. The lone surviving Guardian has come to Earth and bequeathed the final power ring to a young man named Kyle Rayner. With it, a new chapter in the legacy of Green Lantern has begun. But this time, there's no one to train the new bearer of the ring, and he must learn to wield it in a trial by fire against some of the DC Universe's most powerful threats! Nice volume collecting the rise of Kyle Rayner as Green Lantern. Also includes some of Emerald Twilight and Zero Hour to bring the fall of Hal Jordan into perspective. Kyle's one of my favorite GLs ever, especially after his star turn in Tom King's recent The Omega Men: The End is Here, so this was a nice retrospective. The last few issues starring the New Titans were particularly awful, though, and some of the 90s era art work is just hard to look at. There is an afterword by Ron Marz, who wrote Nice volume collecting the rise of Kyle Rayner as Green Lantern. Also includes some of Emerald Twilight and Zero Hour to bring the fall of Hal Jordan into perspective. Kyle's one of my favorite GLs ever, especially after his star turn in Tom King's recent The Omega Men: The End is Here, so this was a nice retrospective. The last few issues starring the New Titans were particularly awful, though, and some of the 90s era art work is just hard to look at. There is an afterword by Ron Marz, who wrote most of this book, but I think it was published some time ago in an earlier collection. It would have been great for DC and Marz to face the event known as the "refrigerating of women" and the way that particular event galvanized many women creators, especially Gail Simone, into getting involved in the comics storytelling aspect. It would be great if DC took the time to add forewards/afterwards/whateverwards to these older collections, putting the stories in historical context, and maybe including essays addressing some of the out of date situations. My first exposure to Kyle Rayner was while reading Connor Hawke’s time as Green Arrow in the late 1990s. I wanted to read more of him and this collection made that super convenient. It gives a nice overview of what happened to Hal Jordan prior to Kyle getting the ring, and it’s also a great introduction to Kyle. I’m not the biggest fan of Green Lantern so it was hard to get into the story at first. However, Kyle is such a charming character that it didn’t take long for me to love him. A superhero My first exposure to Kyle Rayner was while reading Connor Hawke’s time as Green Arrow in the late 1990s. I wanted to read more of him and this collection made that super convenient. It gives a nice overview of what happened to Hal Jordan prior to Kyle getting the ring, and it’s also a great introduction to Kyle. I’m not the biggest fan of Green Lantern so it was hard to get into the story at first. However, Kyle is such a charming character that it didn’t take long for me to love him. A superhero who’s an artist, wears cool leather jackets and lives in Greenwich Village? I never realized it was everything I could have wanted. Another thing that pleasantly surprised me was Darryl Banks’ art. Kyle looked great; he had cool hair and great style. So many 90s comics have extremely cringey artwork that makes it hard to read due to the second hand embarrassment. Good start to the Kyle Rayner Green Lantern run. It starts out pretty lighthearted but gets VERY dark and serious pretty quickly, as Kyle finds out that playing superhero isn't just fun and games. The R.E.B.E.L.S. issue wasn't very good, and the artwork was awful. I wasn't really into the Titan issues, either. The core lantern issues, however, were all really good. I’ve always been a fan of Green Lantern - in the character’s many different forms. However, it was the Kyle Rainer version from the mid-90s that I grew the most attached to. So I was happy to see DC Comics collecting the early issues of Kyle’s start as GL in two separate volumes (and was disappointed to see that DC cancelled plans for a 3rd or any future volumes). The creative team had the unenviable task of getting rid of Hal Jordan and GL Corp and soft-restarting the whole series around just one single Green Lantern ring bearer. The story can be rough and brutal, and the tasteless way in which writer Ron Marz does away with Kyle’s girlfriend still feels wrong 20+ years later. I understand Marz wanted to give Kyle some motivation, some context to understand the dangerous new word that he had entered by accepting the Green Lantern ring, but how he went about it was just wrong. He could have achieved the same outcome, even provide Kyle with devastating loss as a motivator, without treating the character of Alex in such a callous fashion. That being said, the new design for Green Lantern is fun and unique. The art looks great from Darryl Banks. The book’s focus on Kyle learning his way can be fun and entertaining. The drawbacks to this collection are the included issues from REBELS ‘94 and The New Titans. They really don’t provide anything interesting regarding Kyle’s new adventures as GL, in fact they read almost contradictory to what Ron Marz was just getting started with in his writing. DC Comics reprints an epic set of Green Lantern stories from the Post-Crisis era. Having been done for Hal Jordan in the 1980s this collection starts with the early 1990s as it tragically ends Hal Jordan’s run as a Green Lantern. DC Comics in the 1990s introduced strikingly darker story-lines for its superheroes. The Death of Superman, Batman’s Knightfall, Wonder Woman’s Contest, The Dark Flash Saga and in the case of Green Lantern was Emerald Twilight in which Hal Jordan had betrayed and murdere DC Comics reprints an epic set of Green Lantern stories from the Post-Crisis era. Having been done for Hal Jordan in the 1980s this collection starts with the early 1990s as it tragically ends Hal Jordan’s run as a Green Lantern. DC Comics in the 1990s introduced strikingly darker story-lines for its superheroes. The Death of Superman, Batman’s Knightfall, Wonder Woman’s Contest, The Dark Flash Saga and in the case of Green Lantern was Emerald Twilight in which Hal Jordan had betrayed and murdered the Green Lantern Corps. Emerald Twilight is just a very few issues of this collection, but its importance cannot be underestimated. Heroes die, get injured, replaced or see twisted versions of themselves but rarely do they become all that in one story, and in just a few issues. Though in order to truly understand this it's suggested reading the Return of Superman story in which Hal Jordan’s beloved Coast City was destroyed by the impostor Superman and intergalactic warlord Mongul. Coming in time to see the city he loved turned into an abomination he helps the real Superman come back and defeat their enemies. But Hal is now without a home and thought most of his friends and family elsewhere have survived others have not, particularly the millions that had looked up to him as the city’s great hero. Consumed with this loss of life and the belief that he failed his people, Hal becomes a grieving man and then an enraged savage as he covets the power to turn back the clock. He violates the rules of the Green Lanterns and seeks out power to become something dark and evil, he becomes Parallax. All the while there is somebody new who just intends to live his life with his lovely girlfriend as he ends up with a brand-new power of being a Green Lantern and not just any Green Lantern but apparently the last Green Lantern. That person is Kyle Rayner as he ends up working this power with no training and only the great will and creativity of his profession as an out of work artist and his devotion for his girlfriend Alexandra DeWitt. Alex is truly a devoted spouse out to help her boyfriend as he encounters the usual feats from thieves to alien warlords to a killer that destroys him emotionally but unlike Hal Jordan does not become corrupted as he is trained up by another Green Lantern and fights Parallax in an epic battle that ends in another tragedy. As Kyle obtains a victory, he unknowingly ends up restoring the name of the Green Lantern Corps as one man traveling the galaxy at first to simply return home but in the end fulfills the original mission of the beings that wore the ring. Adventures with some unsavory beings are also in this story as well but eventually return home to New York City and an adventure with the Titans. I can only presume that the next collection would be his time with one particular Titan as he further expands his training as a superhero. I’m so glad DC is reprinting Kyle’s stories. I’m a huge GL fan and I’ve never read any of the stuff from the 90s, but finally can! This volume’s strengths are all in the actual issues of Green Lantern. They’re well told and form a cohesive story. The origin for Kyle is great and I appreciate the inclusion of Emerald Twilight, the ones where Hal Jordan snaps and destroys the corps, allowing Kyle to get his ring. The weaknesses are all in the other issues, the ones of REBELS and New Teen Titans. Tho I’m so glad DC is reprinting Kyle’s stories. I’m a huge GL fan and I’ve never read any of the stuff from the 90s, but finally can! 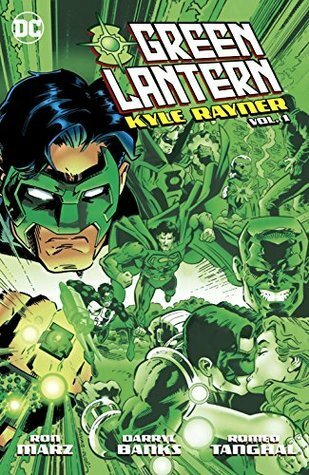 I've always liked the Kyle rayner lantern. (I liked Hal, too). This could have been a great collection if they'd stuck with the first issues rather than jumping around, and having the GL-New titans crossover. A decent, but not great, collection. Kyle Rayner is my favorite Green Lantern and this a read for his early adventures as a superhero. Lots of fun and an enjoyable read. I really enjoyed most of this collection, with the exception of the final two chapters. They didn't seem to fit and were not as well written as the rest.